Discussion in 'Off Topic' started by Prevalent Pegasus, Oct 22, 2012. If none of you know, the Foo Fighters are my kryptonite. theOlderGodz and Ole_Gallagher like this. Nightwish is my choice of artist. Tyrus! Join ME, and together we can rule the galaxy as "Fett & Vader", the stand-up comedy routine coming soon to a Million Mile Club near you! TheDon, Ski, AEON and 1 other person like this. Sabaton. Though I can rally behind Nightwish as well. I see you stand like greyhounds in the slips, Straining upon the start. The game's afoot; Follow your spirit: and upon this charge, Cry — God for Chris! Space and the PC! can you see if anyone else can use your embedded player? It's giving me that "I don't like you" look again. I've been hanging around my Russian friends too much.... I'm into; Aggrotech, EBM, Dark Electro, Industrial, Techno, Rock, and Classical. Some of my favorite Artists are; Psyborg Corp, H.EXE, Eisenfunk, Terrorcat, Asphyxia, Daft Punk, The Prodigy, The Glitch Mob, Pendulum, Crystal Method, Nero, Chemical Brothers and yeah... Im weird but its kay! Paradoxous, Tyvokka, CyroPulse and 4 others like this. Ole_Gallagher, Alex and Tsubaki like this. Daft Punk, Glitch Mob, Crystal Method, 30 Seconds to Mars, Muse, Deep Dish, Orkidea ... these are some of my favorite things. I have loved the stars too fondly to be fearful of the night. - Sarah Williams "The Old Astronomer to His Pupil"
For he loved her, as you can only love someone who is an echo of yourself at your time of deepest sorrow. - Orson Scott Card "Speaker for the Dead"
For myself; Foo Fighters, Rise Against, Deadmau5, Steve Jablonsky, James Horner, Paramore, Linkin Park, The City of Prague Philharmonic Orchestra, Panic! At the Disco, Shout Out Out Out Out, Walt Riberio, The Beatles, Daniel Ingram, Basta, Seryoga, the Vitamin String Quartet, Creedence Clearwater Revival , Milt Buckner, Skrillex, The Wonder Girls, Queens of the Stone Age, Infected Mushroom, The Glitch Mob, Daft Punk, Gorillaz, Flogging Molly, and here comes my favorites: Two Steps from Hell and Audiomachine. Ski, CyroPulse and Tsubakixv like this. Spartan Invicta and Prevalent Pegasus like this. I am in awe! Two Steps from Hell are on Spotify! Spartan Invicta and Zovator like this. 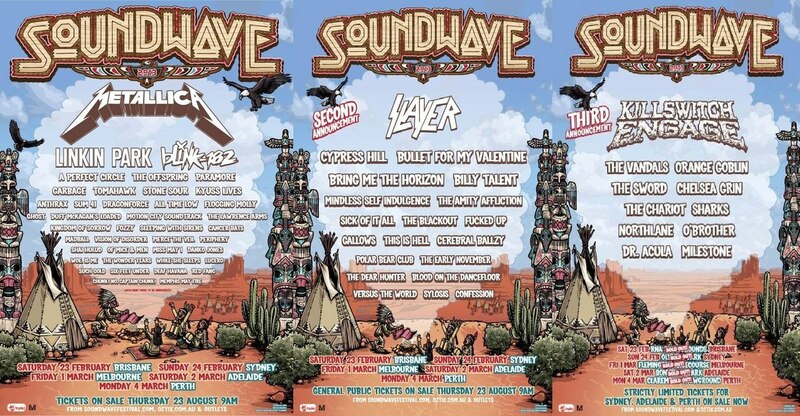 I got my tickets for Soundwave 2013! Zovator and Lance like this.